Here's something...I saw her pics through a myspace friend, and all i thought that i was chatting with this girl through e-mail and through SMS. She said that she was from Makati, and i went over everything else just to go here where i am now. I did try to look for her (sad for me)...and I saw this girl from the RING-0 movie, got her name, searched her pics and dang...I was so dead to my toes seeing this girl whom I thought I was chatting with, and I told myself I'm inlove with this girl and she's a thousand miles away from me and to think that she's also a Japanese actress! Eversince, even though i didn't know that it was Yukie all those times, i already have loved her...and again I said, I ALREADY HAVE FOUND HER AT LAST!!! YUKIE NAKAMA, I LOVE YOU NOT JUST AS A FAN, BUT AS ANOTHER PERSON DEEPLY MOVED BY YOUR BEING...and hey, ain't she really a beau? Don't you agree? and HAPPY HAPPY BIRTHDAY! from your fan/lover!! THE BEST IS Y U K I E NAKAMA BEAUTIFULL!!! nice to know that she finally got the attention she deserves after gokusen 2 became the highest rated dorama of winter season 2005. became an instant fan after ring 0, then admired her more especially after seeing gokusen and trick. she surprised me again in god pls give me more time since she is relatively unknown back then. do your best Yukie, you have a bright future ahead of you! Can't really say that she's the best pick for Yankumi. Knowing since yankumi is pretty unattractive. Been a fan Nakama,Yukie ever since 1998. Mostly due to her captivating presence,and elegant demeanor. It was aggravating not seeing her get the respect that she deserved way back then. Thank goodness much has changed since than. Yukie Nakama is simply awesome in Trick series. I first saw her in Nisennen no Koi and didn't really take notice of her as she is only a small role in tat dorama. However, i started to pay more attention to her when she started acting Trick series. Yukie is a great actress who can potray any role given to her. She is pretty too and talented of course. Comedic, serious, clumsy, tragic, scary, name it she plays it. Amazing actress with lots of talents, the potential is already there. Wonderfully beautiful and hair that would make all the girls envy, she wasn't voted oricon's black haired beauty for the 3rd year running for nothing. Watch trick, gokusen and ring 0, enough said. She has been in my favorite dramas and has a very lively character about her. Most importantly, she's not just a cute face without any talent. She can play all sorts of characters, and that's why I would vote her as an artist as opposed to a lot of other famous people out there who don't act, but just stand there and look cool. I actually saw her first in Toyko Wankai - which was not my favorite drama. However when I saw her in Gokusen and then Trick, I realized how talented she really is. Her timing is brilliant and her ability to play duel personalities is hard to beat. I hope she continues to broaden the scope "female leads" can play in dramas! 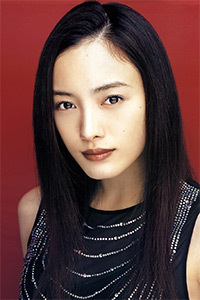 A really memorable actress due to her work in both "Gokusen" and the "Trick" series. In each show, she is able to bring about a certain charisma onto the screen that gives her character so much vivacity. She has great chemistry with other actors/actresses on the set and I hope to see her in more TV Series. yay!it's yankumi! !i absolutely loved her in gokusen!she's just so adorable and she pulled it off very well!she's definitely one of my favorite japanese actresses and i just can't understand why the chracters in gkusen think that she's ugly? !even with the pigtails and the glasses, she's still gorgeous! she's not only a good actress but she's also pretty,gorgeous,beautiful and voluptous...i hope that i can meet you somewhere,somehow. if i could,then i would,even way up high or down low i'll go wherever you will go. I was delighted by her performance in Ringu 0 -- how she was able to become a living image of the pain Sadako felt. She was so young, and already so talented! And Gokusen proved she can also show real comic genius. It's not easy to be so ambivalent. Anything she does, she does well. Simple. OMGOSH~~~!!! I just love this woman!! She is able to adapt to any role she is given (no matter how weird it may be). In gokusen 2, she pulls off the cute and klutzy in one scene and the hott and cool in the next. She's so pretty too ^o^. need to go watch some of her other doramas!! How can you not love her ? Funny, quirky, totally loveble !! She acts like nobody else! She imbodies a new, fresh, and dependable actress. I loved her in Gokusen. Thats when I first saw her. As of the moment she is the no. 1 Japanese actress in my list !! I love her comedic sense of timing, and not many great actresses can do comedy. Don't know why she is always cast as a woman whom others don't find attractive. Nakama Yukie, in my humble opinion, is one of the prettiest (and talented) actresses around. I'm impressed with her talent. I first saw her in Gokusen, then in Trick 1, 2, and 3. And now I'm seeing Tokyo Wankei. Her voice is beautiful and distinguished, she can hold alot of acting power behind that sly little smile. She's so innocently cute. She acts in many different types of shows which makes her a more versatile actress. She does pretty well in most of her shows and doesn't seem to mind taking on protagonist or antagonist rolls. Has a signature smile and is quite beautiful overall. Great actress. I've seen her on the Trick series, Kao, Uso Koi, and the Gokusen series and I think she's a very good at expression and acting different characters. And she has this comic acting style that is great. My favorite J dorama actress. She has a lovely duality: she can be really serious and suddenly start acting as a manga character (as in Gokusen). She also irradiates a powerful aura. I've also seen her as co-host in 56th NHK Kouhaku Uta-Gassen and she was brilliant. She plays both the comedy and dramatic roles equally well. She didn't start off as my ideal beauty, but after watching her in "Trick" 1 & 2, "Kao" and "Ashita ga Arusa," I fell in love. She's quirky, funny and charming (and not too hard on the eyes, if ya know what I mean!). I'm in love! Such a versatile, funny, and convincing actress. From Abe Hiroshi's sidekick through three series of Trick to 3-D gumi's homeroom teacher in Gokusen (Yankumi), she carried those series on her shoulders in her inimitable style. she acts very well and i also think that she is very beautiful and kiree.